It was a highly unusual case to begin with. Rarely has a living artist been legally forced to disprove his authorship of a work that was being offered for sale. 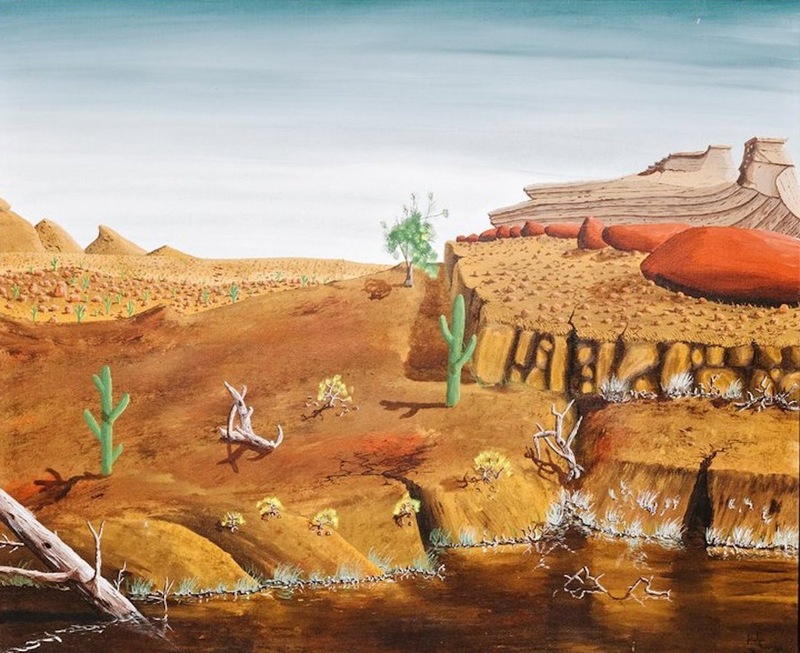 The case resulted from Doig’s refusal to authenticate a work offered for sale by a former Corrections officer, Robert Fletcher of Thunder Bay, and a Chicago art dealer, Peter Bartlow. Fletcher claims to have bought the work from an incarcerated man named “Pete Doige” in 1976. Peter Doig claimed it was not him, but another man who died in 2012. The man’s sister’s sworn testimony and other corroborating evidence convinced Judge Feinerman that it was a case of mistaken identity. This case raises a serious question. How many artists under similar circumstances and lacking the financial wherewithal to endure a legal battle, might be coerced to acknowledge a work that is not their own? This would be a grave disservice to what should be an inherent right of any artist to authenticate — or not — their own work. It is a right that deserves legal protection. Peter Doig (Scottish, b. 1959): Reflection (What does your soul look like), 1996. Oil on canvas, 108 x 78-7/8 inches (274.4 x 200.4 cm). Private Collection. © Peter Doig. Peter Doig (Scottish, b. 1959): Milky Way, 1989–1990. Oil on canvas. Victoria Miro Gallery, London, UK. © Peter Doig. Peter Doig (Scottish, b. 1959): Swamped, 1990. Oil on canvas, 77-1/2 x 95 inches. Private Collection. © Peter Doig. Peter Doig (Scottish, b. 1959): Black Curtain (Towards Monkey Island), 2004. Oil on linen. Mima and César Reyes Collection, Puerto Rico. Photo: Courtesy Michael Werner Gallery, New York and Cologne. © Peter Doig. Peter Doig (Scottish, b. 1959): Red Boat (Imaginary Boys), 2004. Oil on canvas. 200 x 186 cm. Private Collection. © Peter Doig. Peter Doig (Scottish, b. 1959): Road House, 1991. Oil on canvas, 76 x 98 inches (193 x 248.9 cm). Private Collection. © Peter Doig. 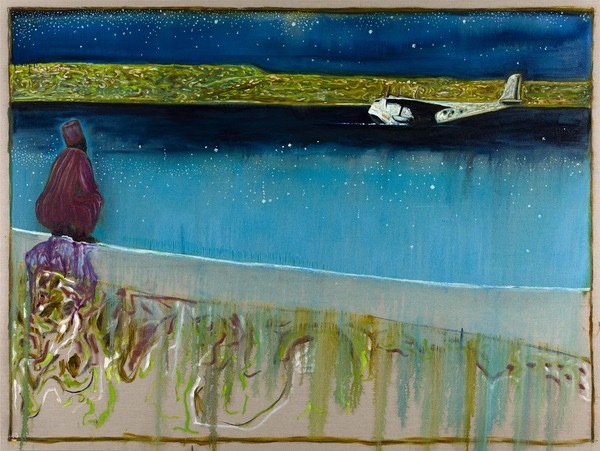 Peter Doig (Scottish, b. 1959): Grande Riviere, 2001-2002. Oil on canvas, 90-1/4 x 141 inches (229 x 358 cm). National Gallery of Canada, Ottawa, Ontario, Canada. © Peter Doig. 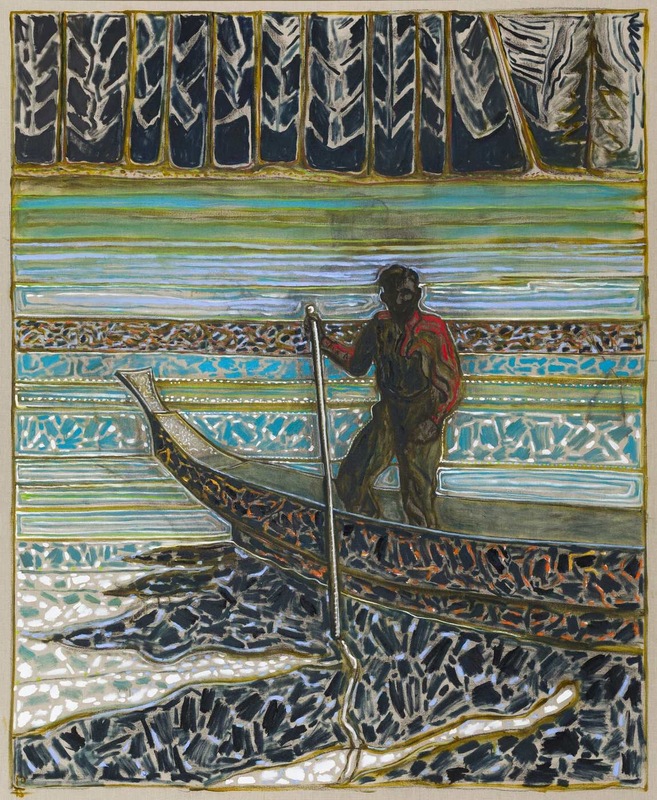 Billy Childish (English, b. 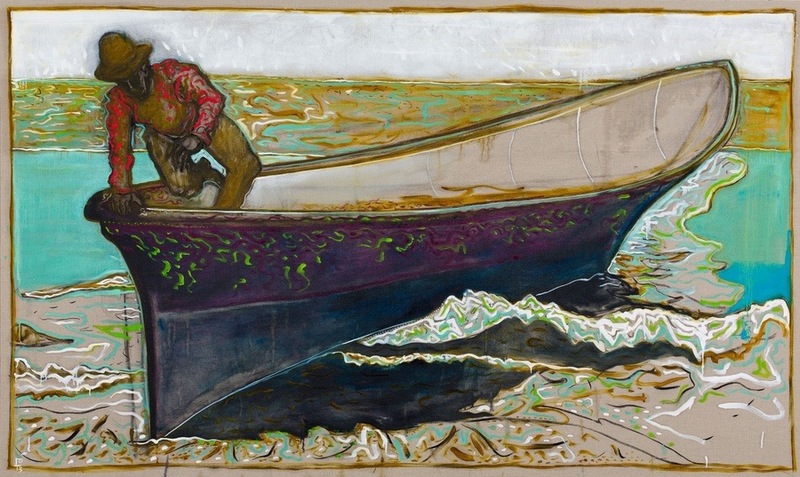 1959): sailish fisherman, 2015. Oil and charcoal on linen. Courtesy the artist and Carl Freedman Gallery, London, UK. Photo: Andy Keate. 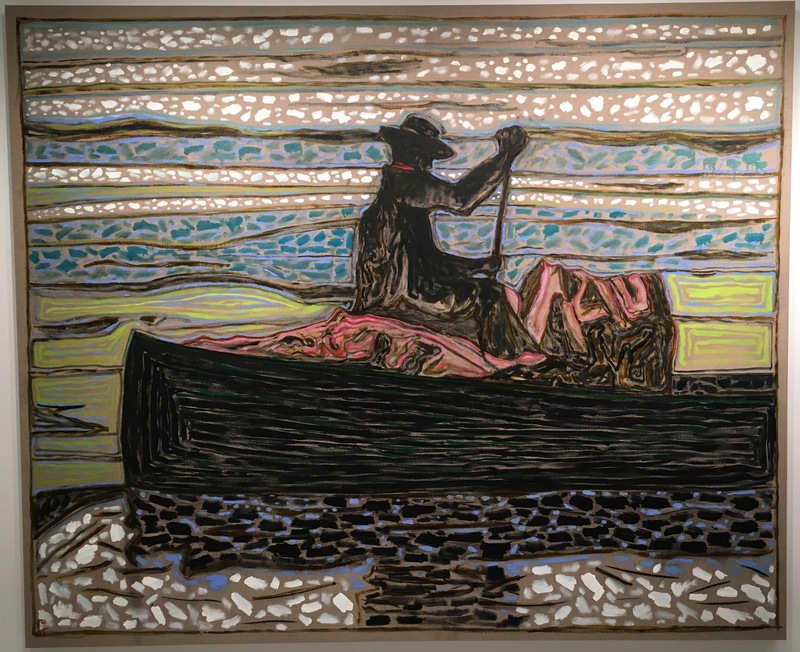 Billy Childish, aka William Hamper, is much more than the sum of his widely known, many moving parts. A creative dynamo, to his credit are over 150 or so albums, 40 poetry collections, 5 novels. He is a co-founder of Stuckism, an internationally recognized painter, an influencer of the YBAs. Ever true to himself, he is a creative force to be reckoned with. Key to this achievement may reside in an imperative drive and desire for freedom. His work, his paintings, emerge unfettered by the clutter of passing artistic trends and fads and a unique voice rings clear and strong. Compelling. I Require Art: Your poetry and writing, your music, your painting, coalesce and converge — and then, you pump them out. The results: raw power, unique, staggering, utterly compelling. I can’t get enough. Clearly, I’m not alone. I say “raw” in the sense of your clear-eyed brutal honesty in extending outward, an essence, a piece, of your complex and unique life. Powerful stuff. —Speaking now of your paintings — energy surges from your works. Palpable. What goes on within you when you paint? … and around you when you paint? … and when you’re finished? 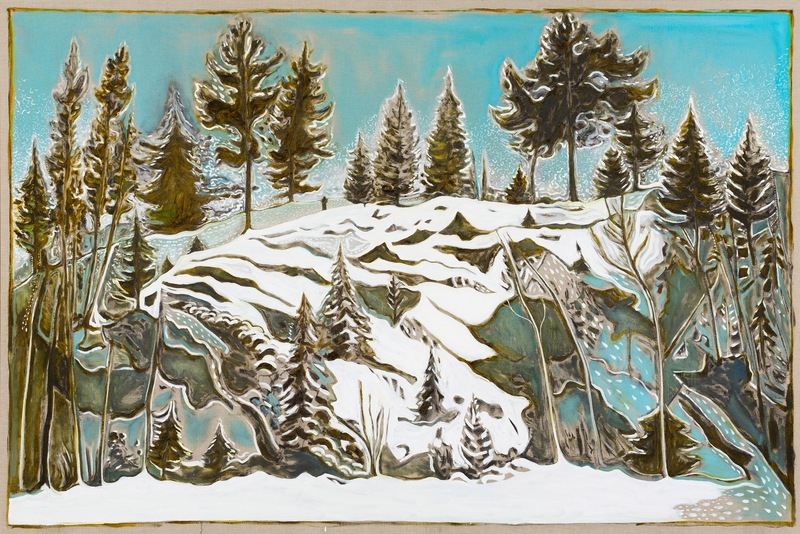 Billy Childish: I paint the large works in my studio which is in the old boatswains office in Chatham Dockyard. Often I conduct interviews as I paint, or chat with one of the young artists I’ve invited to work in the studio. I seem to paint largely from a different part of the brain I use for everyday communication so I can paint pretty much without concern or worry. I seem to be able to paint and talk simultaneously without too much confliction. A painting is started and finished on the same day then I forget about it and get on with life. Billy Childish (British, b. 1959): clamming on maud (Version X), 2013. Oil and charcoal on linen, 183 x 305 cm. Courtesy the artist and Carl Freedman Gallery, London, UK. IRA: Are you aware of a sense of timelessness in your works? What do you think might contribute to this sense of the universal in these vigorous, bold pieces? BC: I like writing and painting (and to some extent music) that can’t be precisely pinned down to the era in which it was made. In his novel Hunger, Knut Hamsun encapsulates this – there’s no big reference to the period it’s written in, so it can fit any time. My paintings are traditionally modern. I’m not romancing a past time but I’m not nailing myself to the 21st Century either. I think there’s nothing as dated as the contemporary: much of the output by young artists in the 1990’s who ‘reflected their time and culture’ looks dated already. Great art transcends time. I don’t choose my influences – they choose me, and I definitely don’t choose to be ‘cool’ or ‘relevant’. Someone mentioned that my group Thee Mighty Caesars, (1985) though often dismissed at the time as being retro – now sound like ‘any time’ where as the pop of the period is very dated. IRA: Can you tell us about your physical process of painting? What interests you most about the process? The when, the where, the mood, the how? BC: I draw quickly with charcoal on raw linen, finishing the drawing with speed (and boldness hopefully). I then paint immediately and allow colours to suggest themselves. I try to get out the way and let the painting paint itself. 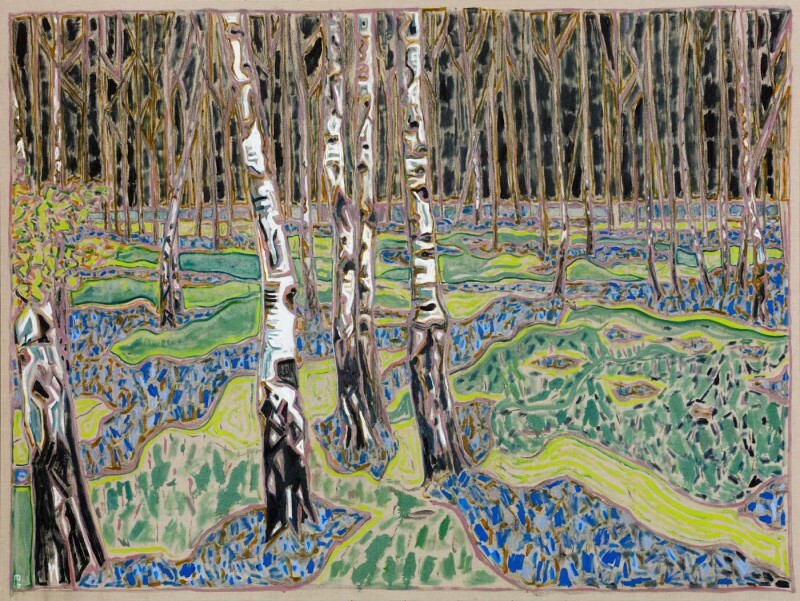 Billy Childish (British, b. 1959): umiak alaska, 2013. Oil and charcoal on linen, 72 × 108-1/10 inches (183 × 274.5 cm). Courtesy the artist and Carl Freedman Gallery, London, UK. IRA: In what way(s) does autobiographical content affect your work? 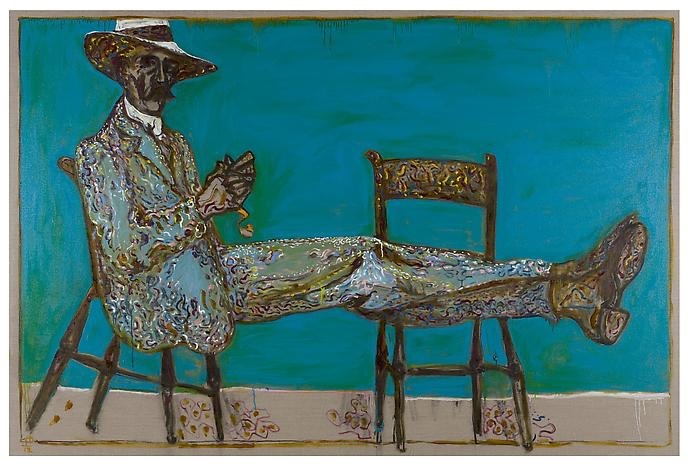 Billy Childish (British, b. 1959): walking in gods butie, 2013. Oil and charcoal on linen, 108.07 x 72.05 inches (274.5 x 183 cm). Courtesy the artist and Lehmann Maupin, New York and Hong Kong. Billy Childish (British, b. 1959): man in a small boat, winter; 2013. Oil and charcoal on linen, 40.55 x 120.08 inches (103 x 305 cm). Courtesy the artist and Lehmann Maupin, New York and Hong Kong. 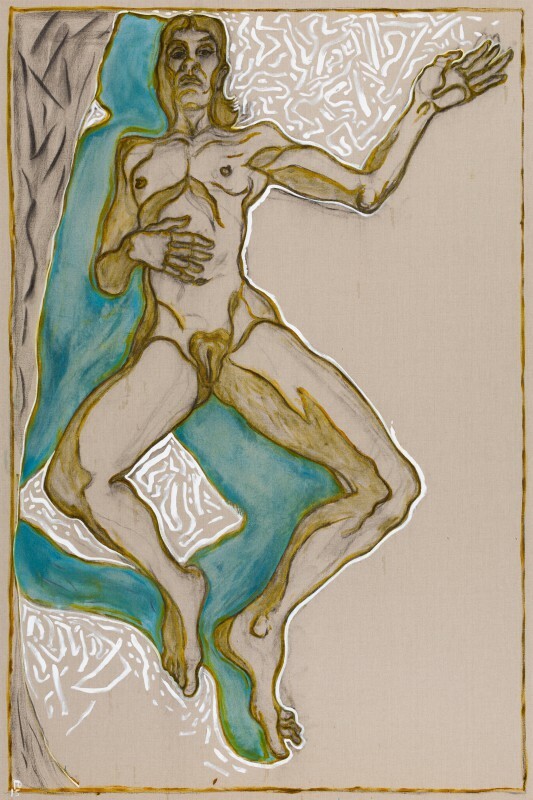 Billy Childish (British, b. 1959): sea of galilee, night; 2012. Oil and charcoal on linen, 183 x 244 cm. Courtesy the artist and Galerie Neugerriemschneider, Berlin, Germany. Photo: Jens Ziehe, Berlin. IRA: Is photography an influence in your work? BC: I have used photography extensively since the early 1980’s. As long as you can escape the 2 dimensions of the photograph (and see round the corners into what’s hidden) it’s not a problem, but I don’t recommend it for everyone. IRA: You are noted as advocating for the artist, the pursuit of the essential values of the amateur vs. the professional. I believe this is extraordinarily relevant in today’s art world. Can you tell us about this distinction, as it affects you personally and perhaps more broadly? BC: I use that as a joke – but a true joke. In French Amateur means ‘done through love’, not to pay the mortgage (which in French means death grip). Amateurs enjoy freedom. I wanted to become an artist because I wanted to be free – not be bound by a job. I also tell people I make pictures, not art – this is another joke at the artists. 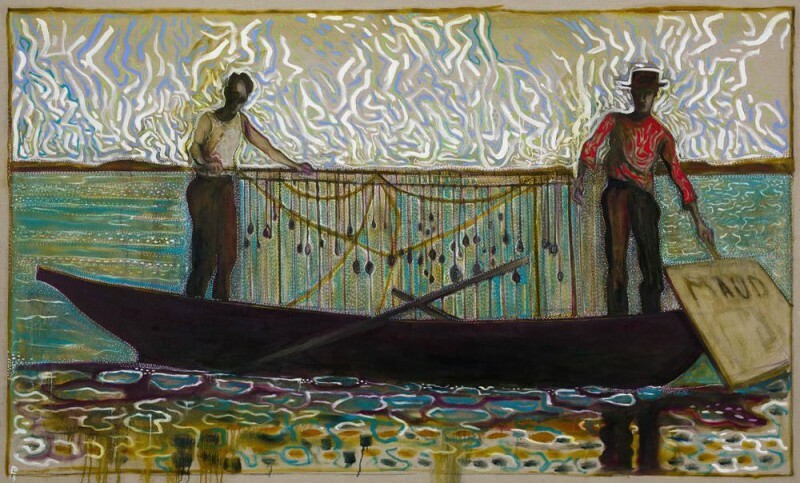 Billy Childish (British, b. 1959): alaska fur packer, 2015. Oil and charcoal on linen, 72 × 87 inches (183 × 221 cm). Courtesy the artist and Carl Freedman Gallery, London, UK. 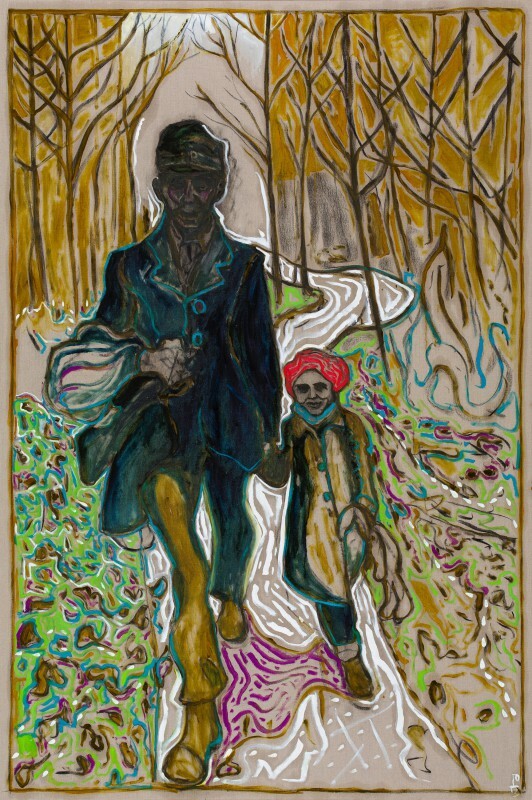 Billy Childish (British, b. 1959): river garden, kroonstad 1901 (version); 2014. Oil and charcoal on linen, 183 x 274.5 cm. Courtesy the artist and Carl Freedman Gallery, London, UK. IRA: How important to you is the act of painting? Is it something you would be able, or choose, to put aside? BC: No I must paint at least every week or two. I believe you can tell if someone is an artist by if they would still create their work on a desert island, or commercial isolation with no audience. IRA: You are a creative gale force wind. How do you navigate the creative flows of music performance, writing, painting? How do your various talents affect or engage with each other? BC: They are joined in that I like the bare bones in all of these disciplines. I write every morning, I paint on Mondays, and I make music when I get the urge. I try not to be a wimp, but also don’t force it. IRA: Does inspiration always flow? Can you speak to what lies at the core of your wellspring of inspiration? IRA: Is there anything you’d like to share with the viewers? BC: Perhaps a few new canvases. 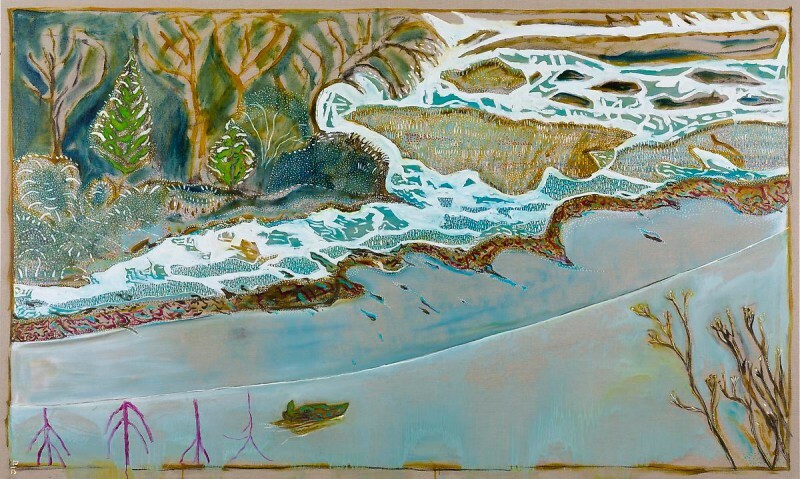 Billy Childish (British, b. 1959): birches with bluebells, 2016. Oil and charcoal on linen. Courtesy the artist and Carl Freedman Gallery, London, UK. Photo: Andy Keate. 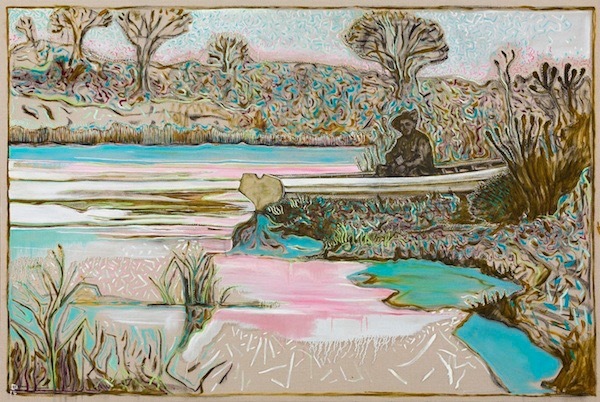 Billy Childish (British, b. 1959): girl reclining version, 2015. Oil and charcoal on linen, 108.07 x 72.05 inches (274.5 x 183 cm). Courtesy the artist and Lehmann Maupin, New York and Hong Kong. Billy Childish (British, b. 1959): man howling to wolves, 2015. Oil and charcoal on linen, 72.05 x 108.07 inches (183 x 274.5 cm). Courtesy the artist and Lehmann Maupin, New York and Hong Kong. IRA: Where and when can viewers next experience an exhibition of your artwork? Our viewers often mention your music performances. Where and when can we next hear you perform? BC: Lehmann Maupin will feature a solo presentation of paintings at ADAA: The Art Show in March 2017, followed by an exhibition at the Goss Michael Foundation in Dallas, Texas in April 2017. It’s also worth keeping an eye on the L-13 (L-13.org) website for forthcoming editions, books and other shenanigans, and the Damaged Goods site (damagedgoods.co.uk) for recordings and news of any gigs (though we have none planned in the near future). Syed Haider Raza, one of India’s greatest painters of modern art and the last surviving member of the Bombay Progressive Artists’ Group (PAG) in 1947, died July 23, 2016 at the age of 94. Members of PAG, all dedicated to developing an Indian visual vocabulary in response to the prevailing European realist influence, included: S.H. Raza, M.F. Husain, K.H. Ara, H.A. Gade, S.K. Bakre, and Francis Newton Souza. S.H. 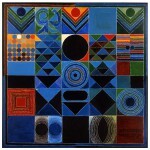 Raza succeeded in integrating formal Western modern art concepts, particularly geometric abstraction, with traditional Indian Hindu and Muslim metaphysical symbols of spirituality, creating a uniquely Indian Progressive art. After early expressionist works, usually landscapes, his style turned toward abstraction. The one constant throughout his artistic journey was a rich and vibrant color palette. 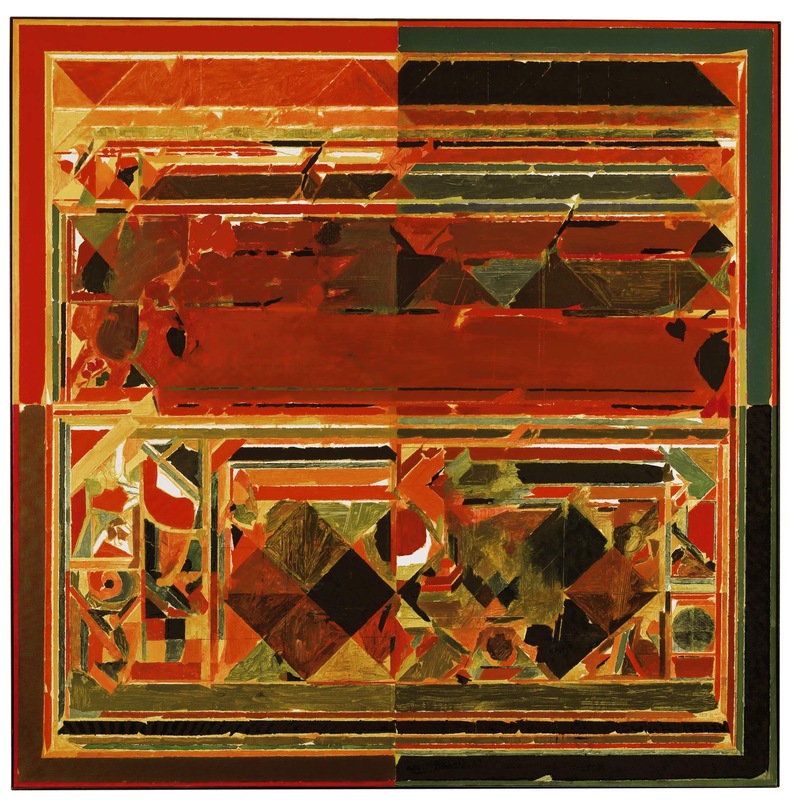 Frequent themes explored by Raza in his instantly recognizable abstractions include prakriti (nature), kundalini (primal energy), tribhuj (triangle) and most significantly, bindu (circle/dot). The artist was the recipient of the Padma Shri, the Padma Bhushan, the Padma Vibhushan and the Legion of Honour (the highest honour awarded to civilians by the French government). 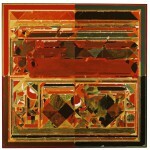 Raza was also a fellow of the Lalit Kala Akademi, India’s national academy of fine art in New Delhi. S.H. Raza (Syed Haidar Raza) (Indian, 1922 — July 23, 2016): Untitled, 1977. Acrylic on canvas, 9.37 x 7.62 inches (23.8 x 19.35 cm). © Syed Haidar Raza. S.H. Raza (Syed Haidar Raza) (Indian, 1922 — July 23, 2016): Village with Church, 1958. Oil on canvas. Collection of Mr. and Mrs. John D. Rockefeller III. © Syed Haidar Raza. S.H. Raza (Syed Haidar Raza) (Indian, 1922 — July 23, 2016): Yugal, 2011. Acrylic on canvas, 100 x 100 cm (39.5 x 39.5 inches). © Syed Haidar Raza. S.H. Raza (Syed Haidar Raza) (Indian, 1922 — July 23, 2016): Prakriti, 2000. Private Collection. Acrylic on canvas, 150 x 150 cm (59.1 x 59.1 inches). RL Fine Arts, New York, NY, USA. Image: RL Fine Arts. © Syed Haidar Raza. S.H. Raza (Syed Haidar Raza) (Indian, 1922 — July 23, 2016): Saurashtra, 1983. Acrylic on canvas, 120 x 120 cm (80 x 80 inches). Private Collection. © Syed Haidar Raza. This artwork may be protected by copyright. It is posted on the site in accordance with fair use principles. S.H. Raza (Syed Haidar Raza) (Indian, 1922 — July 23, 2016): Tree of life, 1998. Acrylic on canvas, 31-1/2 × 15-7/10 inches (80 × 39.9 cm). Dag Modern, New York, New Delhi and Mumbai. © Syed Haidar Raza. S.H. Raza (Syed Haidar Raza) (Indian, 1922 — July 23, 2016): Suryodya, 2007. Acrylic on canvas, 45 x 57.5 cm. © Syed Haidar Raza.